Family and home to me are interchangeable and this is spoken from a true homebody. This project really spoke to me and was a labor of love, this whimsical neighborhood just makes me smile. 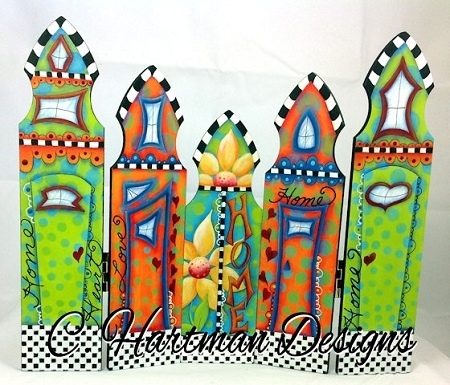 This is the first in a series of projects designed on these pickets which can be found at www.http://creativeartslifestyle.com They were a dream to paint on. This project is fun, easy, and uses a limited paint palette. The design is actually very simple and uses the background colors and pattern to develop the foreground. You could easily substitute a variety of design elements and still retain that whimsical look to the houses. I can see this staying up year round at my house as it does not remind me of any specific season. You are purchasing an E-Pattern and once payment has been received you will receive an email with instructions to download the pattern.